Sehenswertes Interview von Kitco mit dem erfolgreichen Unternehmer Amir Adnani, CEO von Uranium Energy (NYE:UEC) und Chairman von Brazil Resources (TSX-V:BRI). Guest(s): Amir Adnani CEO, Uranium Energy Corp.
(Cayman Islands) - Kitco News speaks with the CEO of Uranium Energy Corporation Amir Adnani about why he thinks uranium is the commodity to watch. 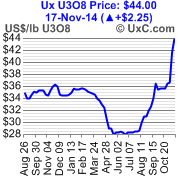 Uranium has had the largest weekly increase since 1996 and is currently trading at its highest level in 18 months, around $42 per pound. “We’ve seen the price rise now over the last 90 days from under $30 to $42 per pound, which is a 50% increase,” he says. Adnani explains how the metal is in a ‘perfect storm..
Der breit diversifizierte, amerikanische Urankonzern kann die geschätzte Ressourcenmenge und die Gehalte auf dem Wachstumsprojekt in Texas beträchtlich steigern und verbessert damit die Entwicklungs-Potentiale.. Die Uran-Nachfrage zieht an und lässt die Preise auf das höchste Niveau während der letzten 22 Monate ansteigen. Der langersehnte Turnaround läuft an. Sehr gute Nachrichten für alle Produzenten und aktiven Projekt-Entwickler, die eine der schwerte Baisse-Phasen aller Zeiten durchlitten hatten..
Der legendäre Unternehmer und Multi-Milliardär Frank Giustra, der schon etliche weltklasse Deals im Minensektor abschloss, erhöht seine Beteiligungen am kanadischen Explorer Klondike Gold (TSX-V:KG) via der letzten Privatplatzierung. Giustra hält über seine Beteiligungsfirmen nun rund 18% der ausstehenden Aktien und betreibt bei Klondike ganz klar "bottom fishing", nachdem der Aktienkurs der Juniorfirma um mehr als 95% seit den Hochständen gefallen war..
Vancouver, British Columbia, Canada, November 20, 2014, Klondike Gold Corp. (TSX.V:KG) (“Klondike Gold” or the “Company”) is pleased to announce that the Company has closed its previously announced non-brokered private placement financing (the “Financing”) (see news release October 2, 2014) of 3,125,000 flow through shares (the “FT Shares”) at a price of $0.20 per share for proceeds of $625,000 and 9,568,082 non-flow through units (the “Units”) at a price of $0.18 per unit for aggregate gross proceeds of $2,347,255. Each Unit consists of one common share and one common share purchase warrant (the “Warrant”). Each Warrant entitles the holder to purchase one common share at an exercise price of $0.20 per common share until November 17, 2017. The securities issued in connection with this Financing will be subject to a statutory hold period of four months and a day which expires on March 18, 2015. Finder’s fees associated with the Financing were paid in cash to Red Plug Capital in the amount of $27,414.00. The net proceeds raised through the Financing will be used, in the case of the FT Shares, to incur “Canadian exploration expenses” in respect of the Company’s Yukon properties as defined in the Income Tax Act (Canada) as well as, in the case of the Units, for exploration and development of Canadian mineral properties and for general working capital purposes. 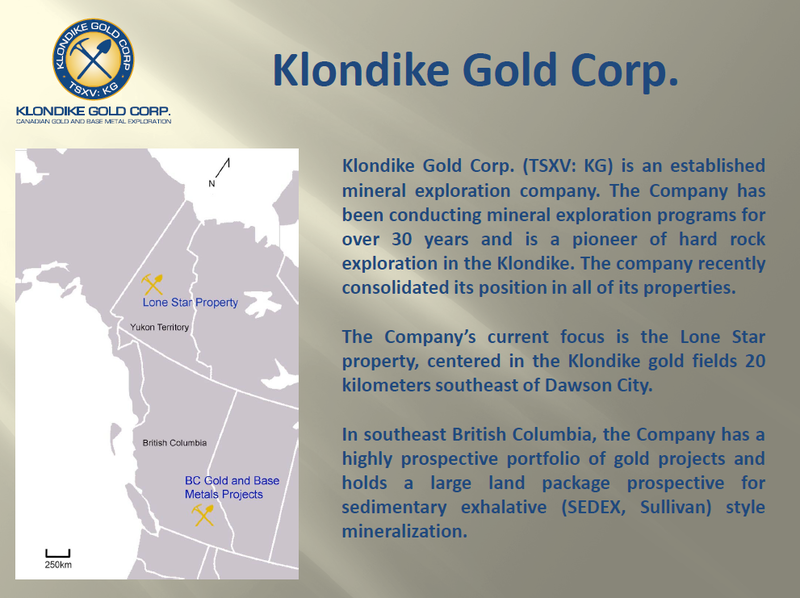 “I am very pleased with the response to the financing and appreciate our investor’s interest in the offering which is a positive comment on the quality of our exploration properties” said Peter Tallman, President and CEO of Klondike Gold. The Company also announces that pursuant to this transaction, Fiore Financial Corporation, a Company owned and controlled by Frank Giustra, acquired ownership and control of 1,580,389 Units at $0.18 per unit, representing 4.93% of the issued and outstanding common shares of the Company. The Radcliffe Foundation a Company controlled by Frank Giustra, acquired control of 887,239 Units at $0.18 per unit, representing 2.77% of the issued and outstanding common shares of the Company. As a result of this acquisition of securities described above, Fiore Financial Corporation, a Company owned and controlled by Frank Giustra, Frank Giustra personally, and The Radcliffe Foundation a Company controlled by Frank Giustra, hold in aggregate, 5,677,378 common shares of the Issuer, representing 17.74% of the current issued and outstanding shares of the Issuer and would own 8,145,006 common shares, representing 23.63% on a partially diluted basis, assuming exercise of the 2,467,628 warrants held by Fiore Financial Corporation and the Radcliffe Foundation. Frank Giustra together with his joint actors, has acquired the units for investment purposes and, as disclosed in the Early Warning Report accompanying this news release, may in the future acquire or dispose of securities of the Company, through the market, privately or otherwise, as circumstances or market conditions warrant..
Mit den aktuellen Goldpreisen kann der Großteil der Goldproduzenten weltweit laut Nick Holland, CEO von Major Gold Fields, kein Geld unter dem Strich verdienen. 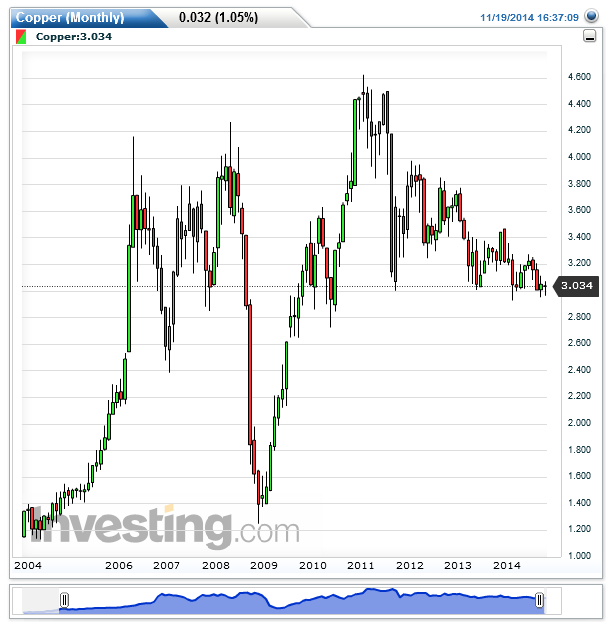 Holland bestätigt damit die massiven Profitabilitätsprobleme der tiefgefallenen Branche..
Gold producers are currently struggling to adapt to a lower bullion price. Gold miners’ costs are mostly higher than current spot prices, increasing the likelihood of writedowns next year, according to Nick Holland, chief executive officer of Gold Fields Ltd.
Across the industry, costs are about $1,300 an ounce including debt repayments, Holland said by phone from Johannesburg today, citing analysts’ research. Gold dropped 0.1 percent to $1,182 an ounce, bringing the decline since the beginning of 2013 to 29 percent. “The industry by and large is under water,” Holland said. “I would expect further writedowns. Production I think will be curtailed but it will take some time to filter through the system.."
Der S&P/ASX 300 Metals & Mining Index (XMM), Australien's repräsentative Benchmark für den Minensektor, fällt zusammen mit dem Eisenerz-Preis auf neue Jahrestiefstände. Dies verdeutlicht die anhaltende Baisse in der schwer angeschlagenen Branche..
Mining and smelting plant in Indonesia, the world's biggest nickel ore exporter before imposing a ban in January. 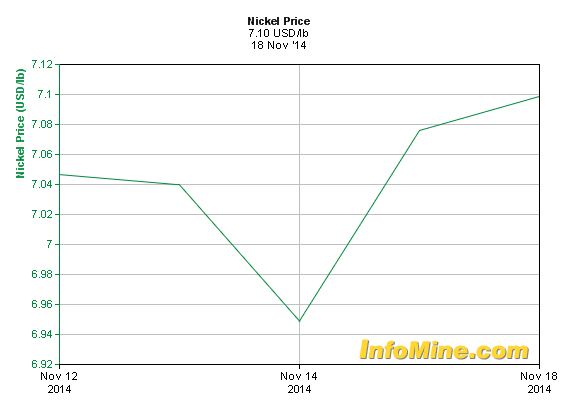 Nickel prices climbed to its highest level in a month on Wednesday, outperforming its base metal peers, as Indonesia confirmed a ban on exports of unprocessed ores remained in place. Metal for delivery in three months on the London Metal Exchange rose 3.2% to $16,149 a tonne, extending gains over the past two and half weeks to 9.6%, after Bambang Adi Winarso, a senior adviser to the co-ordinating minister for economic affairs, announced the ban extension,Bloomberg reports. Ore from Indonesia —the world’s No. 1 nickel producer— is used for generating about 30% of the global nickel supply, which in turn is used to make stainless steel. Most of it is sent to China, where is processed into nickel pig iron (NPI), a cheap alternative to pure nickel. The country effectively halted all but processed metal shipments in January in an effort to force miners to build smelters, winning the country bigger returns from exports of its mineral resources..
Weitere ansehnliche Bohrergebnisse vom laufenden Explorationsprogramm auf dem aussichtsreichen Detour Gold Trend Projekt. Auf der Bug Lake Goldzone trifft Balmoral Resources (TSX:BAR) erneut auf einige hoch-gradige Abschnitte und erweitert erfolgreich die mineralisierte Zonen. Die Aktie des erfolgversprechenden Explorers gehört seit Jahresanfang zu den absoluten Top-Performern im globalen Juniorminen-Sektor und hebt sich damit massiv von der Masse ab. In der Spitze hatte sich die Balmoral-Aktie dieses Jahr schon ver5facht und liegt immer noch rund 220% im Plus. 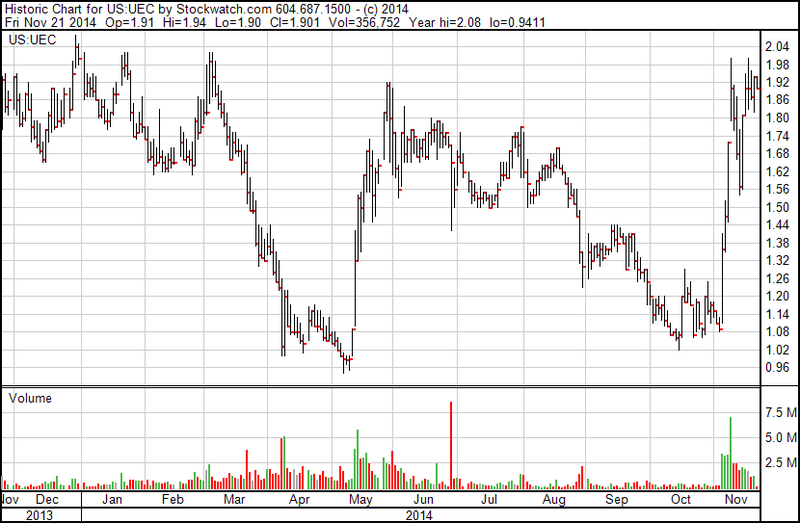 VANCOUVER, BC--(Marketwired - November 20, 2014) - Balmoral Resources Ltd.("Balmoral" or the "Company") (TSX: BAR) (OTCQX: BALMF) reported final results from the 2014 summer drill program on the Company's wholly owned Martiniere Property in Quebec. 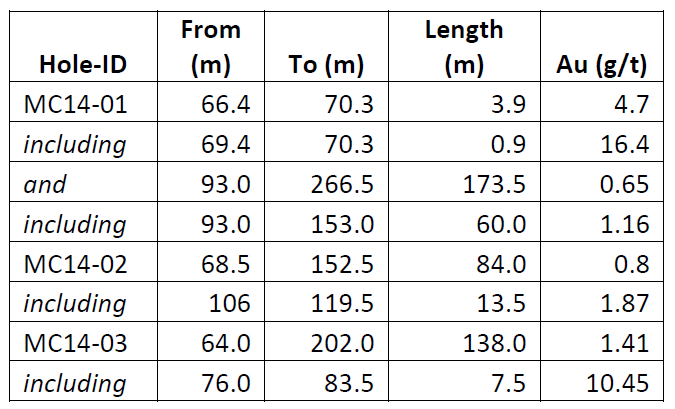 Results from 13 holes along the Bug Lake Trend were reported, 7 from the northern extension of the Trend and 6 from the fault offset area which separates the northern and southern segments of the Bug Lake Gold Zone. 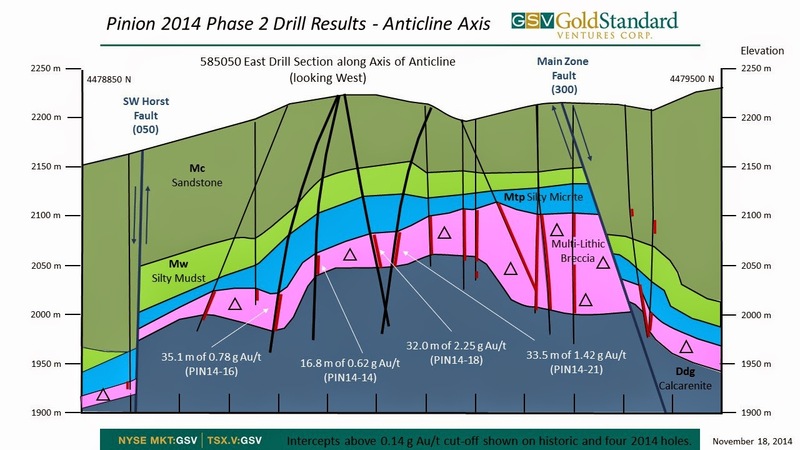 Highlights include the extension of the Bug Lake Trend by 250 metres to the north-northwest, discovery of high-grade gold mineralization in a new, east-west trending (Sunday Lake parallel) deformation zone and a near surface intercept of 14.78 g/t gold over 2.66 metres from the northern extension of the Hanging Wall sub-zone. 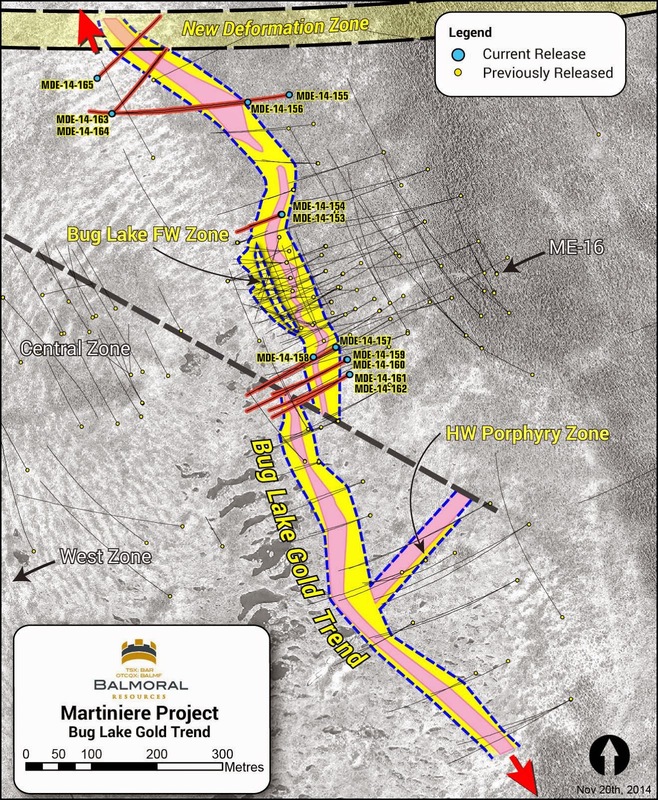 "The discovery of high-grade, quartz-vein hosted, gold mineralization in two locations over 2,500 metres apart along the new northern deformation corridor opens up yet another avenue for gold exploration in the Martiniere area" said Darin Wagner, President and CEO of Balmoral. "It also provides important information concerning the structural architecture of the Martiniere area and highlights a number of additional target areas that have never seen a drill bit." LONDON—Die Seefrachtgebühren auf der verkehrsreichsten Handelsroute zwischen Asien und Europa sind am Montag auf Wochensicht so stark gefallen wie noch nie und senden damit düstere Signale für die globale Konjunktur. Sie spiegeln das stagnierende Wachstum in Europa und Japans Rückfall in die Rezession wider. 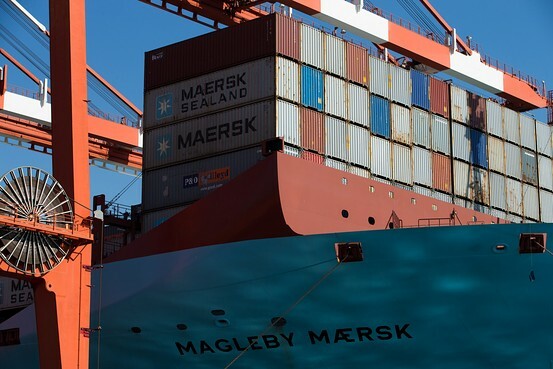 Containerschiffe transportieren alles Mögliche von Haushaltswaren über Kleidung, Spielzeug, Elektronikgeräte und Lebensmittel. Ihre Frachtvolumen gelten als wichtiger Anzeiger für die Lage der Weltwirtschaft. Analysten rechnen mit einem weiteren Preisverfall im Seehandel, weil die Hauptsaison für asiatische Exporte für das Weihnachtsgeschäft bereits vorbei ist. Trotz eines sehr schwierigen Umfelds aufgrund des scharfen Sell-Offs des Ölpreises kann der kanadische Juniorproduzent glänzen und legt beeindruckende Finanzergebnisse vor. Hemisphere Energy (TSX:HME) hat sich auf die Ausbeutung und Entwicklung von lukrativen Öl- und Gas-Projekten in den sicheren, kanadischen Bundestaaten Alberta und British Columbia spezialisiert. Der profitable Juniorproduzent befindet sich auf einem sehr starken Wachstumskurs und kann aufgrund seiner robusten Geschäftstätigkeiten auch bei niedrigen Ölpreisen bedeutenden Cashflow und hohe Profit-Margen generieren. So kann das organische Wachstum aus den laufenden, operativen Tätigkeiten finanziert werden, was natürlich ein großer Vorteil ist. Rekord-Quartals-Produktion von 725 boe/d (86% Öl), was einem beachtlichen Anstieg von 31% gegenüber dem 2. Quartal 2014 und einem Anstieg von 57% gegenüber dem Vorjahres-Quartal entspricht. Am Quartals-Ende wurden weitere Rekord-Förderstände markiert: Die Produktion im September lag im Durchschnitt bei 930 boe/d (92% Öl), was das starke und kontinuierliche Wachstum prägnant unterstreicht. Rekord-Umsätze in der Öl- und Gas-Produktion von 4,7 Mio. USD. Rekord-Cashflow aus den operativen Tätigkeiten von 2,3 Mio. USD (0,03 USD pro Aktie), was einem signifikanten Anstieg von 47% gegenüber dem 2. Quartal 2014 und einem Anstieg von 45% gegenüber dem Vorjahres-Quartal entspricht - trotz wesentlich niedrigerer Energiepreise. Realisierter Netto-Gewinn in Höhe von 833.231 USD bzw. 0,01 USD pro Aktie. Operative Nettomarge (Netback) lag bei starken 42,79 USD/boe, was einer Verbesserung von ca. 2,80 USD/boe gegenüber dem 2. Quartal 2014 entspricht - trotz eines Rückgangs des Ölpreises von mehr als 7%. Reduzierung der direkten, operativen Förder- und Transport-Kosten um eindrucksvolle 29% gegenüber dem 2. Quartal 2014 auf wettbewerbsstarke 14,33 USD/boe. Totale Investitionen beliefen sich auf 6,5 Mio. USD, wobei rund 3,8 Mio. USD für Drilling-Tätigkeiten aufgewendet wurden, was im Hinblick auf die Produktions-Steigerungen für eine hohe Kapital-Effizienz spricht. Starke Bilanz- und Finanzlage: Lediglich 6 Mio. 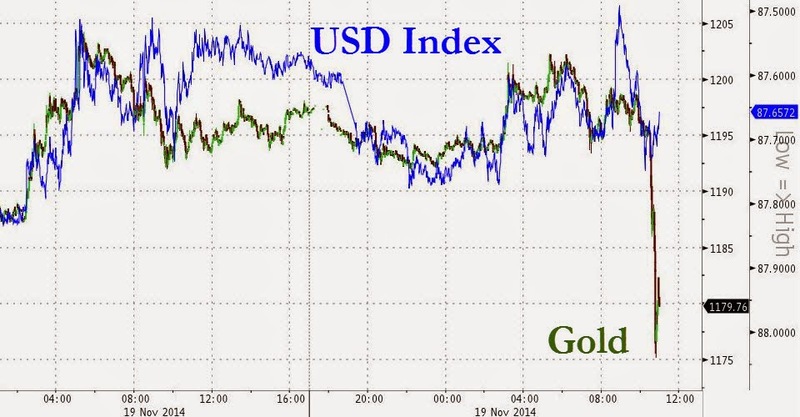 USD Schulden zum 30. September 2014, was nur rund 70% des annualisierten, operativen Cashflows für 2014 entspricht. Erfolgreiche Erweiterung der Liegenschaften in der Atlee Buffalo-Region durch konstruktive Akquisitionen. Die Konzessionen wurden um satte 1.120 Hektar erweitert, welche direkt an die Firmen-Liegenschaften angrenzen. So ergeben sich in Zukunft lukrative Synergieeffekte. Anhaltender Wachstums- und Expansionskurs: Umfassendes Sommer-Bohrprogramm mit 5 neuen Wells (Rekord) wurde im Zeit- und Budget-Plan erfolgreich fertiggestellt. Die Analysten von Industrial Alliance Securities sind mit den jüngsten Finanzergebnissen sehr zufrieden und bestätigen in einem aktuellen Research-Update ihr Kursziel von 1,00 CAD. Industrial Alliance sieht Hemisphere mit diesen starken Profit-Margen auch in einem Umfeld von schwächeren Energiepreisen voll auf Kurs. Besonders erfreulich sei der Rückgang der direkten, operativen Förderkosten inkl. Royalties im abgelaufenen Quartal gewesen, der weit über den Erwartungen lag. Der breit diversifizierte, amerikanische Urankonzern kann die geschätzte Ressourcenmenge und die Gehalte auf dem Wachstumsprojekt in Texas beträchtlich steigern und verbessert damit die Entwicklungs-Potentiale. Uranium Energy (NYE:UEC) befindet sich mit dem Uranpreis seit geraumer Zeit in einem sehr starken Aufwärtstrend. Die Aktie hat sich binnen weniger Wochen fast verdoppeln können. Diese Woche legt der auf die USA fokussierte Urankonzern solide, operative Fortschritte vor und kann die Ressourcen-Basis auf einem wichtigen Firmen-Projekt bedeutend erhöhen. 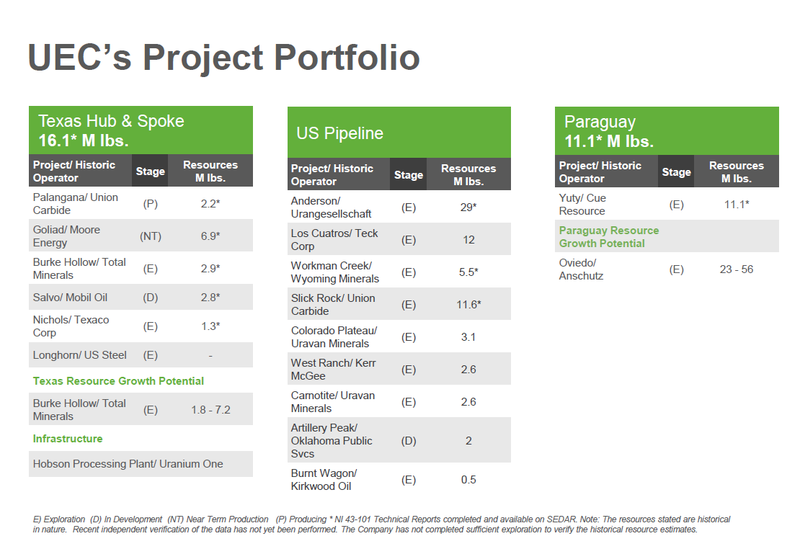 Wie Uranium Energy mitteilte, konnte die geschätzte Ressource auf dem Burke Hollow Uranprojekt in Süd-Texas um beeindruckende 77% gesteigert werden, was die erfolgreiche Projekt-Exploration und die umfassenden Bohrprogramme hinreichend bestätigen. Doch nicht nur die Ressourcen wurden signifikant gesteigert, positive Entwicklungen gab es auch bei den relevanten Urangehalten. Diese operativen Fortschritte und fundamentalen Entwicklungen können sich durch die Bank sehen lassen. Uranium Energy's CEO, Präsident und Gründer Amir Adnani ist mehr als zufrieden: "..Die Hub-and-Spoke-Strategie des Unternehmens in Süd-Texas macht Fortschritte, die unsere Erwartungen übertreffen. Als drittes von sechs Projekten in der Region Süd-Texas gehen wir davon aus, dass sich Burke Hollow ganz einfach in unsere gegenwärtigen Tätigkeiten integrieren lassen und für unsere Projekte Palangana und Goliad zu entscheidenden Synergien führen wird. Zudem befinden sich derzeit noch drei weitere Projekte in der Explorationsphase, die ebenfalls rund um unsere Hobson-Aufbereitungsanlage zu finden sind.."
Andy Kurrus, Uranium Energy's Vizepräsident und Spezialist für Ressourcen-Erweiterungen fügt hinzu: "..Burke Hollow ist eine vom UEC-Team gemachte Entdeckung an der Basis. Bislang haben wir im Rahmen dieses Projekts zwar erst 526 Löcher gebohrt, konnten aber dennoch bereits eine beeindruckende Ressource erschließen. Historisch betrachtet sind bei den meisten früheren ISR-Projekten rund doppelt so viele Löcher gebohrt worden, bis eine Ressource wie die aktuelle Burke-Hollow-Schätzung erschlossen werden konnte. Das Geologie-Team ist zuversichtlich, dass die Ressource bei Burke Hollow noch eine größere Ausdehnung zutage bringen wird. Bislang haben wir drei potentielle Bereiche für weitere Bohrungen ausgemacht, die jeweils zur gesamten Ressourcengröße hinzuaddiert werden könnten. Darüber hinaus stellt Burke Hollow mit knapp 20.000 Morgen ein ziemlich großes Projektgebiet dar (mehr als das Vierfache der Größe unseres Goliad-Projekts), wobei mehr als die Hälfte der vielversprechenden Gegend gar erst noch zu erschließen sein wird." 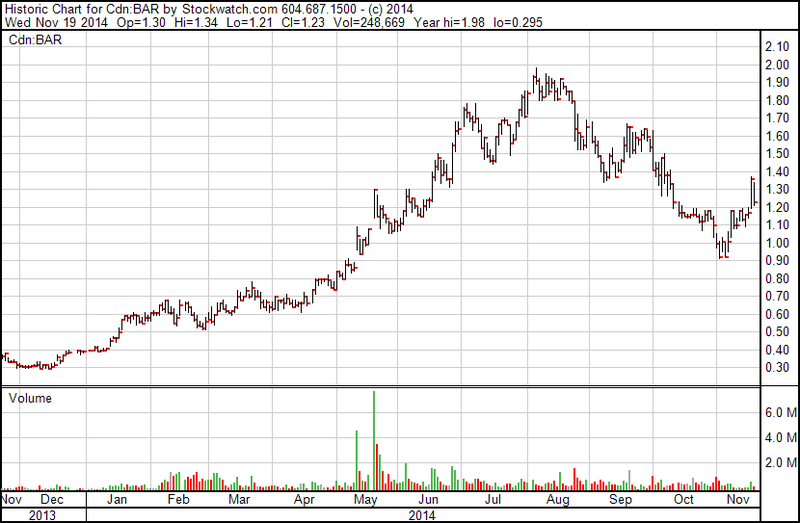 "We recommend Uranium Energy with a BUY and increased share target price of US$2.50 from US$2.00. 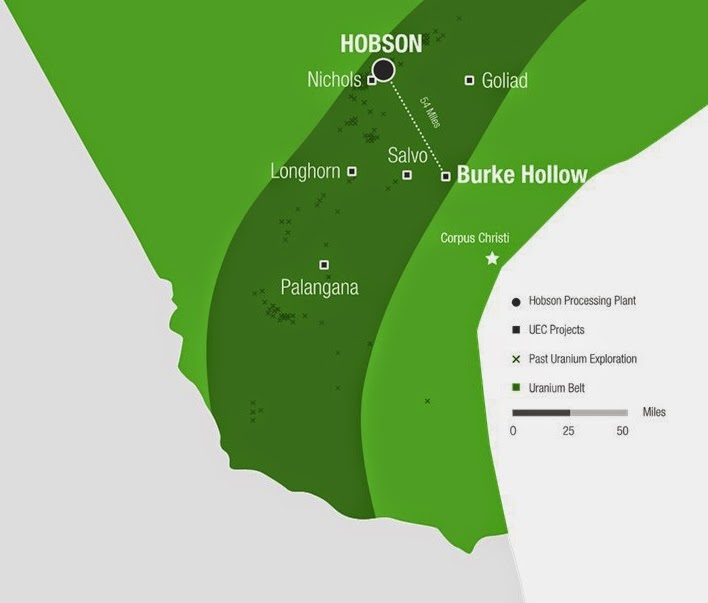 Resource growth at Burke Hollow has allowed us to extend our assumed LOM, while grades and increased Hobson synergies help lower costs. 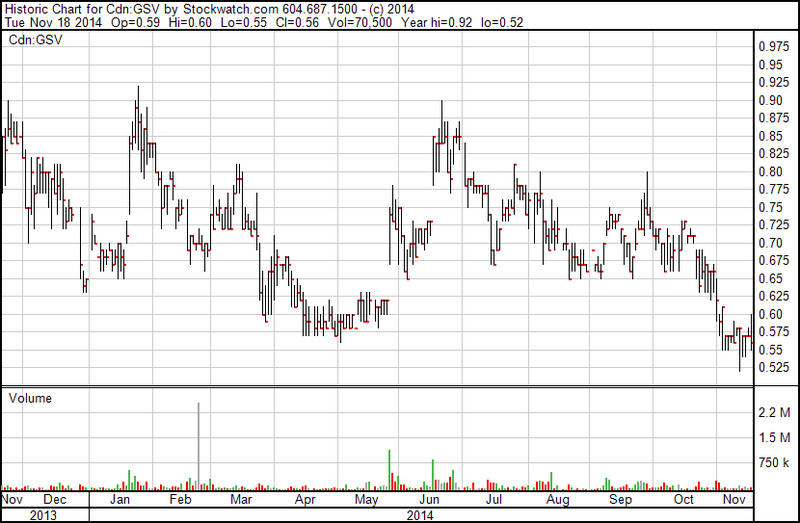 We increase our NAV multiple to 1.2x following a 61% MoM increase in the stock - confirmation of its very strong leverage to rapidly rising uranium prices. With U3O8 prices approaching $45/lb it's possible that we may see production ramp up at La Palangana in the next 12-15 months, and even the possibility of Goliad start-up.."
Die Uran-Nachfrage zieht an und lässt die Preise auf das höchste Niveau während der letzten 22 Monate ansteigen..
"2. 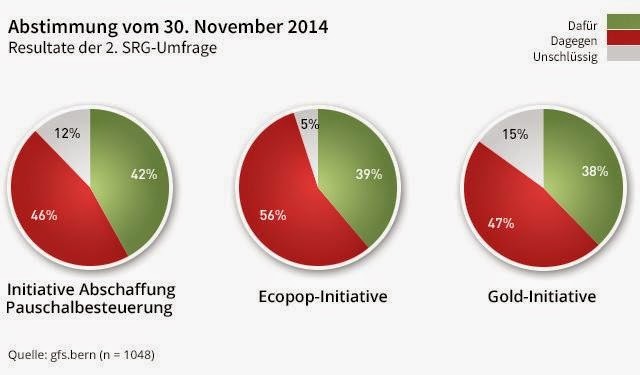 SRG-Umfrage: Gold 38% Ja (-6) zu 47% Nein (+8), 15% (-2) unentsch., das Nein baut sich auf #CHvote #abst14 #goldinitiative"
International hohe Wellen wirft vor allem auch die Goldinitiative der SVP, welche die Schweizerische Nationalbank (SNB) zwingen möchte, ihre Goldreserven praktisch fast zu verdreifachen und künftig vollumfänglich in der Schweiz zu lagern. Ein Ja könnte laut Finanzmarkt-Analysten über Nacht zu einem starken Anstieg des Goldpreises und zu einer weiteren Aufwertung des Schweizer Frankens führen. Doch die Aufregung und die Spekulationen scheinen ins Leere zu laufen, denn die Zustimmung zur Goldinitiative hat in den vergangenen Wochen abgenommen. Sie beträgt noch 38%. Das Nein Lager hat hingegen zugelegt und kommt jetzt auf 47%. Die Initiative werde "aller Wahrscheinlichkeit nach" abgelehnt, sagt Longchamp. Selbst unter den SVP-Wählern beträgt die Zustimmung lediglich noch 62%. Bei der ersten Umfrage gaben noch 70% an, Ja stimmen zu wollen. "Es gibt eine Demobilisierung. Die Partei ist in dieser Frage gespalten, ihre Kampagne ist relativ moderat", sagt Martina Imfeld vom gfs. Der Linken hingegen sei es gelungen, ihre Wähler gegen die Initiative zu mobilisieren, und die Wähler der Mitteparteien seien "stabil" dagegen..
RottMeyer Blog-Beitrag: "Lukas Reimann: Bürger versus Elite – Die Schweizer Goldinitiative"
Top copper execs say prices could be held down by rising supply from mines in the next couple of years but then could surge due to a lack of large projects and bottlenecks at refineries. Copper demand growth of 3%-4% per year over the next five years means 4M-5M metric tons of new supply - the equivalent of 10-12 big mines - would be needed, but the mines do not exist, according to Freeport McMoRan (FCX -1.2%) senior VP Javier Targhetta, saying, "We may see two or three big productions in the next few years but the impact will be diluted by falling production and grades. So I'm extremely optimistic as for where markets will be." 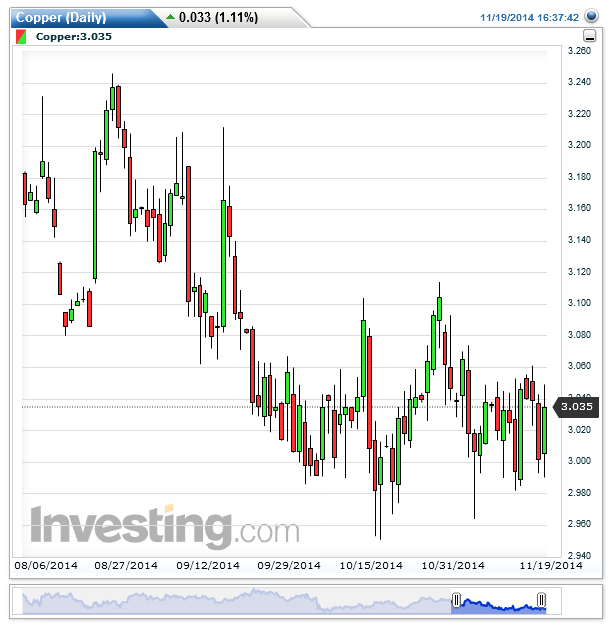 Southern Copper (SCCO -1.6%) CEO Oscar Gonzalez Rocha sees 2015 copper prices at ~$3.15/lb. but "with quite a lot of upside potential." Prices could hit a record $5/lb. over the next 4-5 years, given the lack of major new mines on the horizon and as rising impurities such as arsenic force up costs for miners, Codelco CEO Nelson Pizzaro says..
BHP Billiton (BHP.AU) has poured billions of dollars into expanding its iron-ore and coal mines in recent years. Those days are now over and the world's No. 1 miner has its eyes on a new prize: copper. The shift to this industrial commodity is a bold bet China is shifting to a consumer-driven economy that will consume more copper-laced products after years of heavy demand for steelmaking ingredients iron ore and coking coal. "Copper demand is going to continue to grow for a really long time," says BHP marketing president Mike Henry. "Our confidence in that transition [to a consumer-driven economy in China] is as strong as it has ever been," he says. He expects the market will face a significant shortfall by 2018 and that, without new or expanded mines, global copper demand will outpace supply for at least a decade. (rhiannon.hoyle@wsj.com; @RhiannonHoyle)..."
Uranium advanced to the highest weekly price in almost 22 months amid an increase in demand from power producers, according to Ux Consulting Co., a provider of research on the nuclear industry..
Osisko Royalties (TSX:OR) übernimmt Virgina Mines (TSX:VGQ) für fast eine halbe Milliarde kanadische Dollar. Der neue Streaming- und Royalty-Konzern verfügt über das wertvollste Beteiligungs-Portfolio im Osten von Kanada, das signifikante NSR an zwei weltklasse Goldminen (Malartic, Eleonore) enthält. Mit diesem Deal knackt Osisko Royalties die Marke von einer Milliarde CAD bei der Marktkapitalisierung und schließt damit zu den Branchenführern Franco-Nevada (NYE:FNV), Royal Gold (NDS:RGLD) und Silver Wheaton (NYE:SLW) auf. Osisko's schillernder Erfolgs-CEO Sean Roosen hat durch die Virgina-Akquisition eine noch vollere Kriegskasse, wird eine bessere Bonität erhalten und jagt wie immer großen Visionen nach..
Osisko and Virginia plan to merge. Consider allure - and not just by the numbers. At its simplest, it's the marriage of two very strong royalties in Quebec covering two of Canada's newest and largest gold mines. Virginia Mines and Osisko Gold Royalties said they would merge Monday in an all-share deal that is to make a company with a roughly C$1 billion market cap and two top-of-the-line gold royalties..
Zum ersten Mal nach einer langen und sehr harten Verlustserie zeigen Goldminen-Aktien in den letzten Tagen wieder relative Stärke zum gelben Metall. Seit Ende Oktober haben Goldminen im Durchschnitt mehr als 20% wieder an Wert zulegen können. "This week, we have the popular newsletter writer, Mr. Brent Cook, from Exploration Insights, as our guest. Brent Cook is an independent exploration analyst with 30 years of experience in both property economics and geology evaluations. We brought Brent on the show to get an overview of where the gold market currently is and where it’s headed. Something many investors are unaware of, peak gold, is right around the corner in Brent’s opinion, and it is something that will have dramatic effects on world gold production over the long term. ● Also, Brent Cook’s very own exploration stock picks!" Cliffs Natural Resources (NYSE:CLF) -6.9% premarket after announcing it is seeking to exit its eastern Canada iron ore operations, which may result in the closure of its Bloom Lake mine in Quebec. "With expansion no longer viable, we have shifted our focus to executing an exit option for eastern Canadian operations that minimizes the cash outflows and associated liabilities,” CEO Lourenco Goncalves says. CLF says closing Bloom Lake would cost $650M-$700M over the next five years; it has said previously that ~$1.2B would be required to make the mine viable. WSJ reported last week that Nucor was in talks with CLF to invest in Bloom Lake. Angebotsüberschüsse, schwache Zahlen von China's Häusermarkt und ein unsicher Ausblick sind ein giftiger Cocktail für die angeschlagene und tief gefallene Eisenerzbranche. 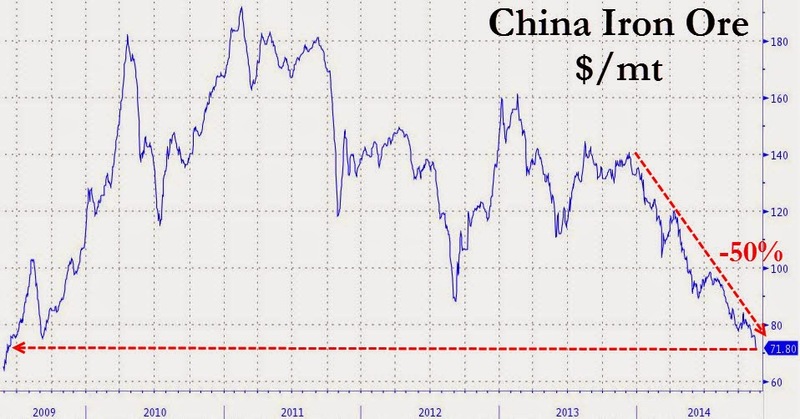 Die Preise für den wichtigen Industrierohstoff brechen weiter ein und stehen seit Jahresanfang nun massiv mit schockierenden 50% im Minus..
Iron Ore prices crashed below the critical $70/mt level overnight, lows not seen since the bottom in 2009, as China's home prices fell for the second month in a row, accelerating losses. 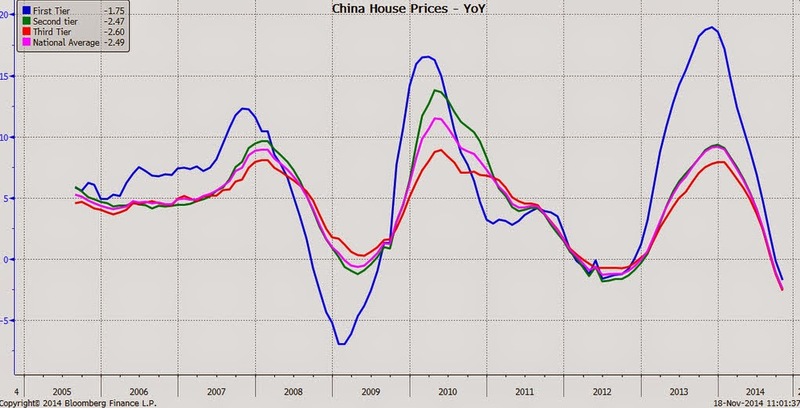 Average property prices across China dropped 2.6% YoY in October (a bigger drop than September's 1.2% YoY slip) with only 1 out of 70 cities seeing any positive price change (Zhengzhou +0.2% MoM). What is perhaps most entertaining is the 38.6% YoY rise in new home starts China just experienced - the biggest jump ever - as the first sign of demand (or hint from PBOC that they would 'help' with mortgages) and supply floods the market. The 'market' appears not to believe the hype.. Die Aktienkurse der Big 3 im Eisenerz- und Minensektor gaben aufgrund des Sell-Offs der Eisenerzpreise schon erheblich nach..
Mit einer 100%igen Trefferrate stößt Gold Standard auf neues Oxid-Gold und erweitert erfolgreich die identifizierten Ressourcen-Zonen auf dem Hauptprojekt in Nevada. 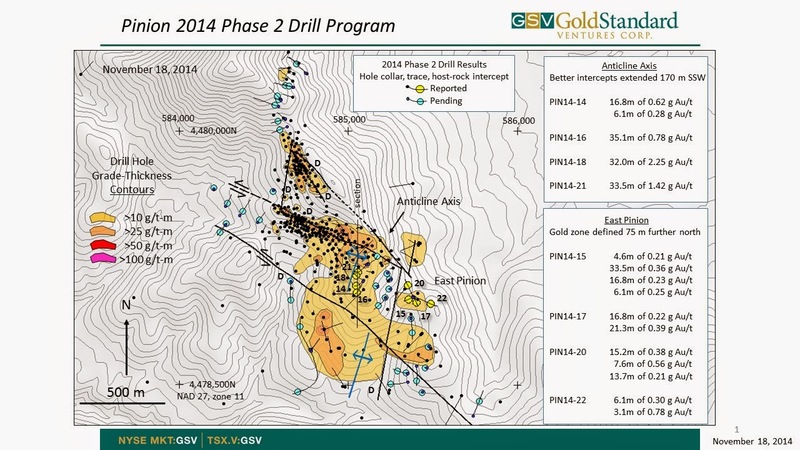 Die kanadische Juniorgesellschaft Gold Standard Ventures (TSX-V:GSV) fokussiert sich auf die Exploration und Entwicklung des Pinion Goldprojekts im US-Bundesstaat Nevada, das sich im Herzen des weltklasse Carlin Trends befindet. Seit September 2014 läuft die Bohrphase II mit dem Ziel, die Qualität, Verlässlichkeit und Größe der Gold-Ressourcen zu erhöhen. Im Fokus der jüngsten Bohrungen stand die Erweiterung der lukrativen, oberflächennahen Oxid-Gold-Mineralisierungen entlang des Streiches und in der Tiefe. Darüber hinaus sollen Expansionsbohrungen aussichtsreiche Bohrziele außerhalb der bekannten Ressourcen-Strukturen testen. Diese wurden im Verlauf der Bohrphase I bereits entdeckt. Nun legte Gold Standard acht neue Bohrergebnisse vom laufenden Explorationsprogramm vor. Und die Ergebnisse können sich mehr als sehen lassen. Alle acht Bohrungen treffen auf bedeutende Gold-Mineralisierungen, wobei eine beachtliche 100%ige Treffer-Rate gewahrt werden kann. So ist es dem erfahrenen Geologen-Team erneut gelungen, eine sehr erfolgreiche Auswahl der Bohrziele vorzunehmen. Das beste Ergebnis der jüngsten Bohrungen lieferte PIN14-18, das auf einem Abschnitt von 32 Metern 2,25 Gramm Gold pro Tonne (gpt Au) schnitt. Der mineralisierte Bohrkern enthielt dabei einen noch höher-gradigeren Abschnitt, auf dem rund 4 gpt Au über einer Länge von ca. 6 Metern getroffen wurden. Hier wurden die Erwartungen klar übertroffen! Insgesamt konnten alle Bohrlöcher auf ordentlichen Längen lukrative Oxid-Gold-Abschnitte aufweisen. So konnten die potentiellen Ressourcen-Zonen vor allem Richtung Osten erweitert werden. Die soliden Bohrresultate dürften außerdem einen weiteren Teil der abgeleiteten Ressourcen in eine höherwertige Ressourcen-Kategorie bringen. Genau das war auch ein Hauptziel der Bohrphase II. Darüber hinaus wurde insbesondere die Gehaltsstabilität verbessert und die Kontinuität der abgesteckten Gold-Mineralisierungen bestätigt. Im Hinblick auf die starken Fortschritte an der Bohr-Front und der Fertigstellung von 44 Bohrlöchern im Rahmen des umfassenden Phase II Bohrprogramms wird der Nachrichtenfluss in den nächsten Wochen hoch bleiben. Die Chancen auf weitere Bohrerfolge stehen sehr gut. Gold Standard rechnet somit mit einer regelmäßigen Publikation von neuen Bohrergebnissen, die dem Aktienkurs neues Leben einhauchen dürften. Aktuell steht die Gold Standard-Aktie noch nahe den Jahrestiefständen und kann auf einem sehr lukrativen Niveau erworben werden..
Statoil (NYSE:STO) says its Johan Castberg oil discovery in the Arctic Barents Sea can be developed profitably even after Brent crude prices have tumbled more than $35 to below $80/bbl from a June high. Developing Castberg with an FPSO unit remains the cheapest option, according to a STO exec, who adds that nearby finds by Lundin Petroleum (OTCPK:LNDNF) have raised the possibility that a combined development including a new onshore oil terminal at North Cape can be commercially viable. Norway's Barents Sea, estimated to hold 40% of Norway’s undiscovered resources and seen as key to halt a long decline in the country’s crude production, lacks infrastructure including terminals and pipelines. 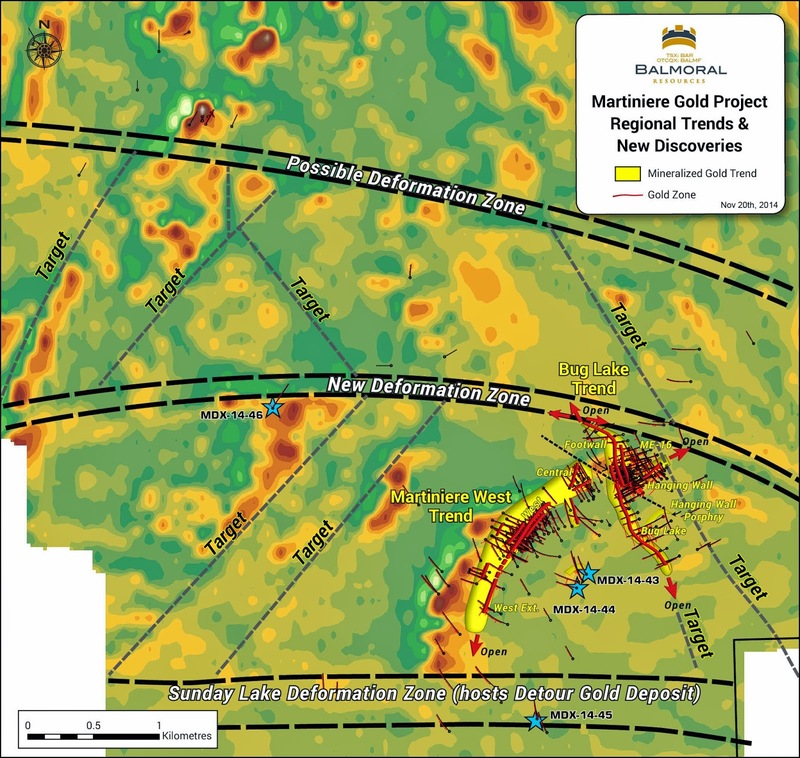 IDM Mining trifft mit Expansionsbohrungen ins Schwarze und bestätigt großes Explorationspotential auf Red Mountain in B.C. Neue, starke Bohrresultate außerhalb der bekannten Ressourcen-Zonen untermauern das bedeutende Potential des aussichtsreichen Flaggschiffprojektes der solide aufgestellten Juniorfirma. 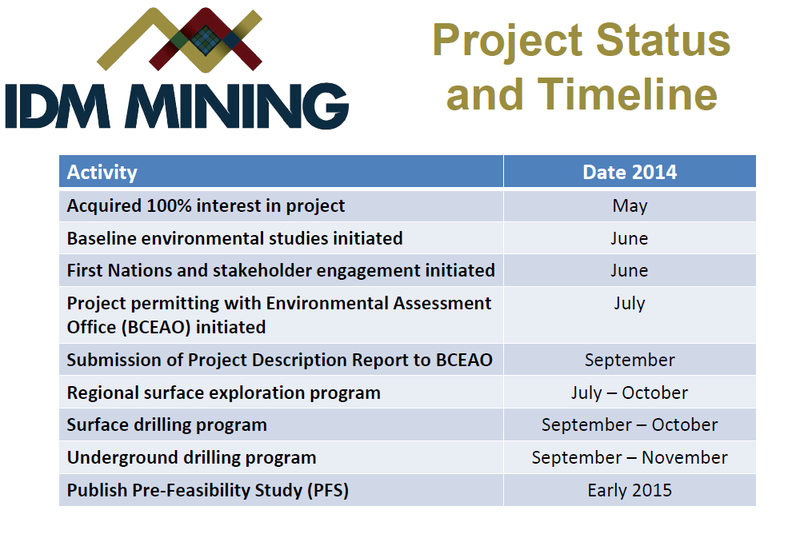 Die kanadische Rohstoffgesellschaft IDM Mining (TSX:IDM), die sich auf die Exploration und Entwicklung des hochgradigen Goldprojekts Red Mountain in British Columbia fokussiert, verkündete vergangenen Woche sehenswerte Bohrerfolge. 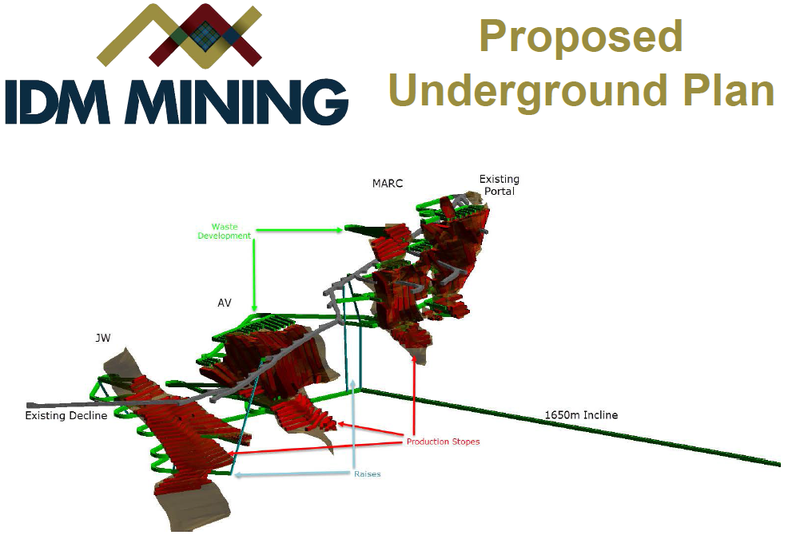 Red Mountain ist das Hauptprojekt von IDM Mining und befindet sich rund 15km nordöstlich von Stewart, einer Kleinstadt mit reicher Historie im Bergbau. Für einen Teil des Red Mountain Projekts, das mit hohen Goldgehalten glänzt, hat IDM Mining bereits eine NI 43-101 konforme Ressourcen-Schätzung, als auch eine positive PEA vorgelegt, die selbst bei niedrigeren Goldpreisen eine robuste Figur abgibt. Nun stehen im laufenden Explorationsprogramm vor allem die Erweiterung der Ressourcen-Zonen an, sowie die Neuentdeckung von werthaltigen Mineralisierungen. IDM Mining ist es erneut erfolgreich gelungen, auf kürzeren Bohrabschnitten hochgradige Gold-Mineralisierungen zu treffen (siehe MC14-01, MC14-03), die sich sehr gut an die Eigenschaften der bis dahin festgestellten Gold-Ressourcen im NI 43-101 Report anlehnen. Diese hochgradigen Abschnitte waren dabei Teiltreffer von niedrig-gradigeren, längeren Drilling-Intervallen. Erwähnenswert ist an dieser Stelle auch, dass die zwei langen Treffer (MC14-01: 173,5m @ 0,65gpt Au und MC14-03: 138m @ 1,41gpt Au) nicht nur auf solide Goldgehalte trafen, sondern auch in vorteilhafter Tiefe, d.h. bei 64m bzw. 93m bereits auf werthaltige Mineralisierungen gestoßen sind. Dasselbe gilt für Bohrloch MC14-02, das ab einer Tiefe von bereits 68,5m auf einem Abschnitt von 84m 0,8gpt Au schnitt. Das sind definitiv ansehnliche Ergebnisse, die sich positiv im nächsten Ressourcen-Report wiederspiegeln werden. Weitere Ergebnisse von historischen und neuen Proben von der 141er-Zone werden IDM in Kürze vorliegen. Dadurch soll das Verständnis über die geologischen Strukturen erneut verbessert werden. Die Junior-Firma erhofft sich durch die intensiven Proben-Programme auch verlässlichere Ergebnisse über die detaillierte Breite und Mächtigkeit der werthaltigen Gold-Mineralisierungen, die bis zu diesem Zeitpunkt noch auf Näherungen beruht. IDM hat die Bohrarbeiten in den Projekt-Zonen Cambria, Marc Extension und AV fertiggestellt. Die ausstehenden Ergebnisse der neun Bohrlöcher werden laut Management bald von den Laboren zurückkommen und können dann nach intensiver Analyse publiziert werden. IDM sieht sich auf Kurs, einen neuen NI 43-101 konformen Ressourcen-Report und die mit Spannung erwartete Vor-Machbarkeitsstudie (PFS) für den fokussierten Projektbereich im ersten Quartal 2015 vorlegen zu können.